NEW PORT RICHEY — Never heard of pickleball? No problem, says Lee Boerckle. 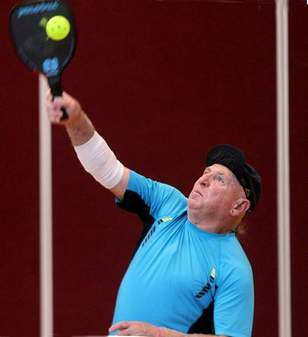 “Think of a ping-pong game, but you’re standing on the table,” said Boerckel, a Hudson-area resident who organized last weekend’s March Madness Pickleball Tournament at the New Port Richey Recreation and Aquatic Center. A racket sport invented in the mid-1960s, pickleball is played by two or four people in a surface roughly the size of a badminton court with a net that is about the same height as the one used in tennis.